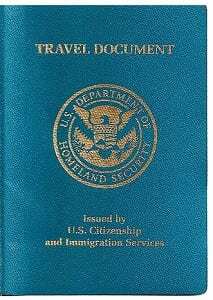 If you are a lawful permanent resident (“LPR”) green card holder, you are allowed to travel out of the U.S. and return. However, if you travel outside the U.S. for 1 year or more, your U.S. permanent resident status could be considered abandoned if you took up residence in another country during that time. USCIS allows you to apply for a reentry permit in order to establish that you did not intend to abandon your permanent resident status and allows you to travel abroad for up to 2 years without having to obtain a returning resident visa abroad prior to your reentry into the U.S. The re-entry permit also allows you to use it much like you would use your passport as a port-of-entry officer would place visas and entry and exit stamps in your passport. So this permit can be used as your primary travel document even if you cannot or do not want to get a passport from your home country. If you have plans to travel outside the U.S. as an LPR and need to travel abroad in the near future, you should plan on filing the reentry permit request and attending your biometrics (fingerprint) appointment prior to departure. We have helped many clients successfully obtain their reentry permit. Please contact our Portland Immigration Lawyer at (866)691-9894 for any questions you have related to the reentry permit request.